NOAA has issued its annual forecast for the hurricane season, along with its now-standard explanation that there is a natural cycle of multidecadal (40-60 year) length in the North Atlantic circulation (often referred to as the “Atlantic Multidecadal Oscillation”–see Figure), that is varying the frequency of Atlantic tropical cyclones, and that the present high level of activity is due to a concurrent positive peak in this oscillation. There was not one mention of the possibility of global warming being a partial factor for these changes (see also this NY Times report on two recent studies). The average reader of newspaper articles on this prediction might well have concluded that there are in fact two camps on this subject – one global warming, one natural variability. But I think there is a one-way commingling of the camps. I suspect that most people leaning toward global warming as a contributor to the unusual increase in the magnitude of Atlantic tropical storms and hurricanes would readily concede the possibility that the AMO could, in addition to the El Nino/Southern Oscillation, modulate any greenhouse gas contribution to the enhanced activities of tropical storms. It is not at all clear to me that the natural variability camp sees any need to commingle with the global warming community. Is there any way to distinguish as to the relative strengths of arguments of these two camps? Actually, it is quite easy to do so. 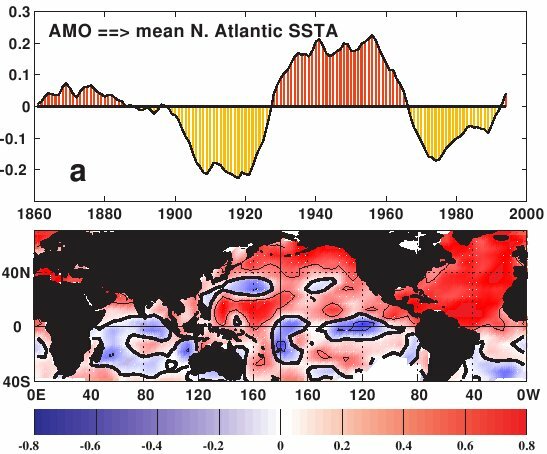 If the natural variability argument applies there should be little difference in the statistics of the present phase of the AMO with the past. But global temperature data incontrovertibly indicate that there has been a widespread warming since the previous positive phase of the AMO (e.g. 1940-1960). This type of warming cannot be produced by the ocean circulation, which to a first approximation just moves heat around on the planet – what it robs from Peter it gives to Paul. Furthermore, rigorous statistical studies indicate that the pattern of warming can be attributed to greenhouse gas increase. I have seen no effort to conduct a standard “detection and attribution” approach to the alternate explanation of the AMO. I encourage the AMO proponents to try it; it is somewhat more objective than simple declarative statements that the AMO are responsible for the observed warming. Update: The two papers referenced in the NY Times article are now available online: Mann and Emanuel (2006) and Sriver and Huber (2006). I have ads and I know they don’t pay for page views. I doubt the premise on its face. I imagine the rules are different for bloggers and for big commercial sites. Perhaps we should continue the discussion on Mark York’s excellent blog, remembering to click on the ads, of course. I am curious about the use of ACE as a statistic in a number of postings here as opposed to Emanuel’s PDI value. The latter seems to actually be a measure of the energy dissipated by the storms while the former frankly appears to be another product of the AMO crÃ¼e. Later today I may get a chance to run some of these statistics and rankings with PDI in its place, but in the meantime I was hoping for an explanation of when to prefer one measure over the other. I am probably being too harsh about the provenance of ACE, but I believe my reaction illustrates how a betrayal of trust from a “trusted authority” (NHC) in one area can affect one’s trust in other areas. The Wiki article doesn’t provide much context for “click throughs.” Ads from Amazon, Google and others only pay for sales of actual products from a click through. The ads are free. I get the idea that S Molnar was being facetious in his/her post referring to me and thus is an ad hominem. I get this a lot. You said that NOAA’s mission is to provide forecasts that are as accurate as possible. NOAA’s National Weather Service (NWS) mission requires that NWS staff provide public education in weather, water and climate. NWS is equipped to do that, having local offices in all states and having direct ties to state and local governments and to state climatologists, private sector meteorologists, local and national media and public schools. Therefore, after watching the CBS Evening News interviews on global warming with NOAA director Jim Baker in Jan. 2000, 5 nights, and after learning of the changes in timing of spring snowmelt flooding in the Upper Midwest, I believed that dealing with Upper Midwest climate change in hydrologic modeling, flood outlooks and public education was part of my duty as a hydrologist and public servant at NWS North Central River Forecast Center (NCRFC), located in Chanhassen, MN. My duties from 1980 to 2000 included representing NCRFC at all annual Inter-agency Winter/Spring Snowmelt Flood Outlook Group meetings. In my January 2000 presentation to the inter agency group at the St. Paul Corps of Engineers District office, I repeated the words of Jim Baker on CBS News that global warming was happening. My supervisor, NWS NCRFC Hydrologist in Charge (HIC), had instructed me not to bring up the subject of global warming, saying that “global warming was beyond the time window of our hydrologic mission”. I disagreed with him, and said that global warming was already having effects on the timing of spring snowmelt flooding. Also in January, 2003, the NCRFC HIC reminded me what he said he told national media before they interviewed him during the disastrous Midwest summer floods of 1993, … that his instructions to national media in 1993 were to not mention global warming. It’s no wonder that the public in the U.S. is ill informed on global warming and climate change. There has been and still is no public education by the U.S. government agencies on global warming. It should be a primary responsibility within agencies of NOAA, including NWS. Also in January, 2000, the NCRFC HIC reminded me what he said he told national media before they interviewed him during the disastrous Midwest summer floods of 1993, … that his instructions to national media in 1993 were to not mention global warming. It’s no wonder that the public in the U.S. is ill informed on global warming and climate change. There has been and still is no public education by the U.S. government agencies on global warming. It should be a primary responsibility within agencies of NOAA, including NWS. Only 1950, 1961 and 1955 are pre-aerosol reduction. Only these three and 1995 are not in the most recent decade. The list is similar to, but not identical to the ACE list. Nevertheless, it also shows 6/top 10 in the last 10 years. I don’t think it makes any sense to draw trend lines for measurements prior to 1930: The measurements are not compatible. Even going from 1930 to 2005 you have to apply a correction to make satellite and pre-1970 airborne data compatible. I am curious about the use of ACE as a statistic in a number of postings here as opposed to Emanuel’s PDI value. The latter seems to actually be a measure of the energy dissipated by the storms while the former frankly appears to be another product of the AMO crew Later today I may get a chance to run some of these statistics and rankings with PDI in its place, but in the meantime I was hoping for an explanation of when to prefer one measure over the other. I am probably being too harsh about the provenance of ACE, but I believe my reaction illustrates how a betrayal of trust from a “trusted authority” (NHC) in one area can affect one’s trust in other areas. There’s nothing in ACE that is specific to the AMO. Just read the definition. It is merely a sum of the squares of the sustained max windspeeds, taken 6 hourly. Comparably, PDI is an integral of the cubes of the sustained max windspeeds. PDI is an approximation of measure of power dissipated; true power dissipation also requires integrating windspeeds across the wind field of the entire storm. Unfortunately records of storm wind fields are sparse and of low quality prior to about 1965 or thereabouts. Re #104: From the Wiki article: “CPM (Cost per Thousand) advertising is the most common basis in the business”, that is, a plurality of advertising rates are based on page views. My quick, unscientific survey of online newspaper sites seems to confirm this, although there may be a bias created by discarding those that don’t make their rates readily accessible (and Canada Free Press, the villain of the story, appears to charge a flat fee, at least for some ads, which must ultimately be driven by page views). Also, the joking was not meant to be at your expense – I enjoy your site, and the world would be a better, if not cooler, place if more people would click through and buy the advertised Richard Dawkins book. The oceans’ level is uneven? Re: #112 – Yes. I believe that predictions of future ocean level rise have mentioned that the level might rise faster in some places than others. 1. Wind stress: Where the wind consistently blows in one direction compared to another then it will push the water along underneath it. This is what causes the ocean to “pile up” in the warm pool area around Indonesia; when the winds slacken the warm water can “slosh” back to the east and spread out -> El Nino [?]. This can also cause a storm surge, for example the 1957 flood when a storm pushed water south, down the North Sea. Cyclones tracking north towards Bangladesh have a similar effect. 2. Surface atmospheric pressure. If the atmospheric pressure is lower then there is less atmospheric weight pushing the ocean down and it will rise up. This also produces storm surge effects. Since atmospheric pressure is not identical [over space] in a time-mean then this could cause differences between one location and another. 3. Earth’s rotation: This will mean that “sea level” will be higher at the equator than the poles, but this is a constant effect so would not change. 4. Tidal effects due to gravity of moon and sun. I think this would probably even out to zero over time though. Also wouldn’t be changing either. I’d assume that the changes in Arctic sea level were due to local time-mean changes in surface atmospheric pressure, although I don’t know wheter there have been trends in sea-level pressure observed there. Obviously the effect of melting sea-ice is to lower sea levels [since water is more dense than ice], but I wouldn’t have thought that this effect would be confined to the Arctic region. Because of the Coriolis force, water actually piles up to the right (left) of the winds in Northern (Southern) hemisphere. As a result, sea level is higher in the middle of the large oceanic gyres than on the sides. In general, for large scale flows on a rotating planet, the fluid flows around the “hill”, not downhill, as seen in the tendency for the air to flow around large-scale lows and highs in the mid-latitude atmosphere, rather than from high to low pressure. The Stommel model that provided an explanation of the intensification of currents on the west side of the gyres shows the difference in sea level over the gyre. It also indicates that the poleward west corner of the gyre will be the lowest (e.g., in the North Atlantic, the corner by the Canadian Maritimes). The magnitude of the height differences are related to the differences in the winds over the gyre. I believe the differences predicted by the Stommel model are on the order of a couple of meters. Large changes in snow and ice on land has large effects on sea level, but large changes in floating ice (sea ice) does not. Land rebounds from the loss of snow and ice, which can give the appearance of falling sea levels. Much of North America was still rebounding during the 20th century from the loss of ice over Alaska, Canada and the Upper Midwest near the end of the last ice age, about 10,000 years ago. Re#109, I agree with much of what you said, which is why I kept trying to make the point they were simply “interesting observations” and nothing very demonstrative. There are a lot of climatic trends/data pre-1970, pre-1930, etc, that I feel the same way about. RE#111 Duly noted, but one has to have a large readership to garner that level of advertising. The average blog doesn’t qualify for the rates even a small newspaper would warrant. I’m a Wes Clark supporter. And as a part of the Clark Community Network, we’ve started a featured blog called “Real Science,” having just completed a series on Global Warming (which you can find through my url linked to my name). Clark also did a podcast series on global warming, which he completed not too long ago, which you can find through his site at http://www.securingamerica.com . General Wesley Clark is a genuine champion for science. Both the General and members of the The Clark Community Network blog regularly on science and policy. I chatted briefly with him just before the panel. I saw his notes–he had a few bullet points and Chris Mooney’s bio written out. That was it. So I was blown away when he confidently took the podium and spoke eloquently for half an hour, basically off the top of his head! Gen. Clark not only underscored the vital role of science in our nation’s history and future, he also mentioned that he wanted to become a physicist at one point. Clark didn’t hold back or skirt any issues, choosing instead to talk about the misuse of faith by religious opportunists and other related topics that many potential candidates would evade at all cost. So the blogosphere is working hard on this issue, and I can tell you of at least one serious contender of a politician who is very much at home discussing scientific issues, including, most certainly, what’s occuring with our climate – General Wesley Clark. Wouldn’t it be great if Real Climate could hold an information-sharing conference specifically with current politicians in mind? I betcha Wes Clark would love to be a part of that. And if Al Gore could be a part of facilitating such a discussion… well, I think something like that would be just grand, ;-). There has been some talk in this thread on the U.S. politics of climate change. I will respectfully chime in on this issue. First, a little background on myself. I am an associate professor in political science at the University of Miami. My area of specialization is U.S. environmental policy and politics. I have published two books on this subject matter: _Corporate Power and the Environment_ (2001, Rowman & Littlefield) and _The Politics of Air Pollution_ (2005, State University of New York Press). There has been some suggestion in this thread that the Democrats are better on climate change than the Republicans. I would humbly submit that in terms of their respective records the Democrats have only been marginally better on this issue than Republicans. The only difference between these Parties is that the Clinton Administration did sign the Kyoto Protocol, but only relucantly so. Additionally, when it came time to negotiate the Protocol’s implementation the Clinton Administration demanded extensive loopholes for the U.S. economy — so much so that its demands prevented an international agreement on the implementation of the Protocol. It should be noted that Senate Democrats voted in unanimity to oppose the Protocol (in the form of a resolution). Finally, the Kerry presidential campaign did not prominently discuss the climate change issue — if at all. To gain some insight into why there is a bipartisan lack of political will to confront the massive U.S. contribution to climate change, as well as why the U.S. economy is a prime cause of global warming, I would humbly recommend reading my article: 2005 June. “Urban Sprawl, Global Warming, and the Limits of Ecological Modernization.” _Environmental Politics_ 14, no. 3: 344-62. Why buy a book from a militant antireligious bigot? Dawkins writes well and has interesting things to say about evolutionary biology, but his tirades against all forms of religion say a lot more about his psychology than about the supernatural. Contrary to his worldview, understanding and using science does not necessitate atheism, and it’s silly and wrong to say it does. We are getting pretty far afield, but I feel this comment deserves an answer. I can’t find a reference anywhere in these comments to the “advertised book” by Richard Dawkins, so I don’t know which of his books was recommended. Let me just say that describing Dawkins as a bigot because of his atheism and critiques of relgion is unwarranted. Serious people, particularly believers, should consider Dawkins’s arguments, and not reject them out of hand because he is a non-believer.. But, in any case, in most of Dawkins writings, atheism is a minor component, and his breadth of knowledge about evolutionary biology is breathtaking. I found his latest book, “The Ancestor’s Tale” particularly stimulating. I don’t accept everything Dawkins says as gospel, but he is always interesting to listen to. In response to George Gonzales in #120 and picking up on raypierre’s response in #4. Point taken. It is true, politically speaking, that there is indeed bipartisan baggage on this issue (wasn’t it Senator Byrd from West Virginia who was one of the strongest against the Kyoto protocol in the 90s?). So, yes, this is most certainly an issue that needs to be taken up in earnest by members of both parties of our system, as well as independents. I appreciate how Al Gore addresses that as well; galvanizing public will among the citizenry in general seems to be the most significant key to changing governmental policies, which Gore is especially emphasizing. I mention Wes Clark because he happens to be one of the potential political leaders who is quite comfortable with this issue and the arena of science in general. He has demonstrated this on numerous occasions. Further, the call was put out there earlier in this thread for such leaders. So I thought it appropriate to respond with what I know about one such person. I also felt it appropriate to say that if citizens want such leaders, they need to seek them out and support them – it’s a two-way street between potential leaders and our citizenry. Hopefully, there will be insightful and courageous people across party lines who will be able to stand up and work with our citizenry on this, able to handle all that will apparently come at them from contrarian positions, as Al Gore is now contending with, and do so with a depth of accurate knowledge at their command. For beyond the executive branch at the federal level, we need such leaders throughout our local, state, and federal levels of government (and industry). I seem to have provoked an unintended firestorm by my post in #100 (Talk about your unforeseen feedbacks!). All I wanted to do was warn about a potential “Banned in Boston” effect of increasing the commercial success of those newspaper sites that publish nonsensical anti-global warming articles by following links to the articles from this site (“Savaged by RealClimate!”). In view of the small number of people who are likely to do that, it probably isn’t worth worrying about. Can we stop now? Why are many politicians unable to accept the evidence that our fossil fuel emissions are the dominant cause for the out of control catastrophic global warming which is confronting us now. In order to fully understand the U.S. response to climate change, including that of both major political parties, we have to grasp the role of urban sprawl in the U.S. economy, and now the world economy. Urban sprawl was seized upon as a means to revive the U.S. economy during the Great Depression. Urban sprawl increases economic demand for such consumer durables as automobiles (most obviously) and appliances (because homes on the urban periphery tend to be larger and able to accommodate more appliances, furniture, etc.). The positive relationship between urban sprawl and automobile consumption, for instance, was evident in Los Angeles during the 1920s, wherein Los Angeles land developers were national leaders in building planned communities far from the city’s center and trolley lines. By this time Los Angeles was also the highest per capita consumer of automobiles. Today the U.S. has the most sprawled urban zones in the world, and is the largest per capita consumer user of automobiles. In 1934 the Federal Housing Authority (FHA) began subsidizing/mandating the building of sprawled urban development (low density housing construction on city outskirts) â?? to the neglect and detriment of center centers. The FHA was the key driver of urban sprawl in the U.S. until the late 1960s. (It did so through loan guarantees on “qualified” homes.) It was during this period that the consumer durables revolution was embedded in the U.S. â?? whereby consumption of consumer durables exceeded income gains in the U.S. The downside of urban sprawl is that it creates demand for huge amounts of energy â?? both for automotive transportation and to heat/cool, electrify large homes in sprawled suburban areas. Of course, when this huge energy demand is filled with the burning of fossil fuels the result is large amounts of carbon dioxide emissions. This is why the Bush Administration, along with Congressional Democrats (and Al Gore), is interested in dealing with climate change emissions through the deployment of technology and alternative fuels. In other words, the hope among political elites, and economic elites (see the International Chamber of Commerce), is that new technologies and forms of energy can be developed and deployed that allow the huge energy consumption required for urban sprawl to persist without the negative externality of climate change emissions â?? or this externality being greatly minimized. This is in contrast to a tack of reducing climate change emissions by limiting consumption of fossil fuels, which could readily be done by reforming U.S.’s sprawled urban zones. Of course, my ability to lay out my arguments and evidence is limited in this venue. Anyone who has further interest in these can refer to my book _The Politics of Air Pollution_ (although this is mostly focused on localized air pollution), the article I noted before, and my article that will appear in the August issue of _Environment Politics_: 2006 August. “An Eco-Marxist Analysis of Oil Depletion via Urban Sprawl.” _Environmental Politics_ 15, no. 4. In #126, I meant re: 125. My apologies. Please disregard #126. This is a typo. please explain the details…. Contrarians need to review their stance, in light of such a massive consensus amongst our best and brightest. Re #120: George, I’m quite interested in seeing this article, but do you have a link to it? Thanks. Re #129: Steve, I am afraid I do not. But if you post your email, I can sent you a copy. Re #128: Actually, it’s “Hawking”, not “Hawkins”. And it’s “Wigner”, not “Wegener” (although Wegener, while not a physicist, was certainly a great scientist). You are correct, I think, that scientist celebrities such as Hawking can have an impact greatly disproportionate to their expertise in the field. After all, the famous letter from Einstein to Roosevelt was really written by Leo Szilard (who, like Wigner, was Hungarian, I might irrelevantly add); Einstein didn’t know enough about nuclear physics to have an informed opinion, but he knew enough to trust the real experts, and they knew enough about politics to ask Einstein to sign the letter. There’s probably a lesson to be learned from that. Re: 132. Yes, Mr. Molnar, that Szilard and Wigner were Hungarian is indeed irrelevant to the point but nonetheless somewhat pleasing to me… GRIN! BTW I’m a native of Brazil. My apologies to all the readers of this site for this personal indulgence in ancestral pride. To say that the AMO is not, nor cannot ever be, connected to Arctic temperature rise, decreasing ice mass and ice cover, and rising CO2 and water level and temperature is to say that the AMO is a causal black box, not connected to anything, existing in its own meta-reality. And, I suspect, its supporters measure it in such causal isolation. Atlantic hurricane activity has been tied to this rarified view of the AMO. There is a lot at stake here both for the GW deniers as well for those who have spent lifetimes measuring the AMO as a statistically predictive event for hurricane activity. When this nut cracksâ?¦and it will crackâ?¦then the last nail will be driven into the coffin of the deniers. I hope we do not have to wait long. A lot is at stake. The Dawkins ad on my blog was for An Ancestor’s Tale. Ray, you are most kind. Since Iâ��m neither a mathematician nor a historian I did a little fact checking on Google.I believe you may be referring to Elisabeth of Wittelsbach who was the daughter of Duke Maximilian and the Duchess Ludovika. Though not of Hungarian Origin herself she was crowned Queen of Hungary in 1867. She was assassinated in 1898, so she would still have been queen during the period when Hungary first organized the Eotvos competitions circa 1894, which may have been sort of a precursor to the Mathematical Olympiads. #129, #132… Thanks for the correction, sometimes I write phonetically rather than paying attention to the finer details. #132, like the parallel with Einstein and Roosevelt. Is one reference, Hawkings doesn’t go into details, I think he understands the Physics of AGW though. I am a fan of Alfred Wegener because he theorized on optical effects which I recently filmed. Some of these effects are related to the thermal Gradient of the lower troposphere which may have something to do with GW. GW denier Ronald Bailey is on the job. I haven’t looked at the details, but invite the staff here to in a post. People are already using this. raypierre, I won’t try to defend Teller from a moral standpoint, but I don’t think he ever denied the truth of basic science, although he did make some implausible technological claims. The bad guys this time don’t have anyone of Teller’s stature on their side, and I don’t see how that can change. On the other hand, science has fallen into such disrepute with the public (or maybe it’s just that the public has reached new levels of ignorance and apathy), at least in the United States, that Feynman’s death probably left us without a genuine scientific celebrity who can really help. Hawking is the closest thing, but I’m not sure his proposed solution of going to the moon can be called helpful. I would like to think that if, say, Murray Gell-Mann were to go around doing an Al Gore impersonation people would sit up and take notice, but I fear it would go unnoticed except by those who don’t need persuading. Still, it seemed like a good idea before I thought it through. On the question of Hungarians and mathematics: The Hungarian language is completely phonetic. The story goes that one of the Americans at Los Alamos asked one of the Hungarians why Hungarians are so good at mathematics, and the reply was “While you were studying spelling, we were studying mathematics”. I have my own theory, but I won’t bore you with it. Politicians and the public have been unable to accept the evidence on catastrophic global warming because of an absence of public education by the U.S. government. The agency with the responsibility and resources to do the job is not getting it done. The NOAA group has produced a “seasonal climate summary” addressing the 2005 hurricane season. So: what’s the real evidence for the multi-decadal oscillation? Are there reliable temperature proxies that can be used to extend the ocean temperature record in the Atlantic? How far back do the actual time series go? The proxy record? In his book “the Last Generation” by Fred Pearce he tells a story of the amount of Carbon in the atmosphere. According to his book the atmosphere has seldom held more than 600 billion tonnes of free CO2 and humankind has added another 200 billion tonnes. He then proceeds to tell us that 850 billion tonnes of free CO2 is quite serious and with the accumulation of 4 billion additional tonnes per annum (7 billion in actuality but 45 % is absorbed by the oceans etc) and we can see that in 12 years it could spell big trouble for spaceship earth. Apparantly 1 trillion tonnes is really serious and that is going to be achieved “with the business as usual attitude” by around by the year to 2060. Personally I do not believe that humankind knows what to do about climate change. We have all become affulent and greedy and life with cars, planes, aircon and central hearting has become so cool and wonderful we do not want to give it up at any cost. All governments do not want to commit to anything unless all other Governments do and hence we have a major problem. Climate scientists tell us 65% cuts required and Governments have agreed 5% (the USA has not even done that !!). Potential serious climate change is going to happen. Sites like 321energy.com tell me it is anyway. problem in the attachment transferring, let me give a summary. any luck yet and are expected to keep contacting NWS and NOAA offices. #141 Pat donâ��t know if it is strictly a case of lack of education as there are a whole lot more graduates out there. There seems to be a strange form of peer pressure where completely out of their depth well-funded apparatchiks work on a misguided, misleading PR campaign aimed at electing like-minded politicians against AGW theory. It is rather a political problem, which has been trying to mix itself with science personalities, albeit with those who agree with the politicians. However, Stephen Hawking sent a message that we need to be as wise as the science we’ve created, or the moon might eventually be a nicer place. This message is for all who live on this planet, to be wise enough to recognize the correct science. But to reverse this strange quagmire where a few contrarian scientists overtake the majority, a whole lot more scientists than Dr Hansen and RC guys must speak out openly with conviction and explain the fundamentals of AGW or to at least warn about not controlling GHG emissions, grace and patient explanations eventually always out do nonsense. An overwhelming number of well known scientists tackling this issue will trickle down a better understanding to everyone, this would eventually kick in to most media producers that its not a 50/50 debate but rather a 95% consensus against a 5% small group of contrarians enjoying TV exposure, the money and attention their stance attracts. Well, actually, Archimedes noticed that a solid body floating in a liquid displaces its own weight of liquid. If the solid body is ice — sea ice or an iceberg — its melting will simply produce enough water to fill the hole in the water that the sub-surface part of the ice was occupying. No change in sea level (other than the rise in sea level when a grounded glacier calves an iceberg into the ocean. It is well-known that Hungarians and Finns are descendants of a race of extra-terrestrials — explaining their preternatural accomplishments in science, mathematics, music, chess, and athletics. There is a story that when the Finns and the Magyars were moving west out of Siberia, they got to far-eastern Europe and decided to split all their possessions and take off in different directions. They also split the language. The Finns got the vowels and the Hungarians got the consonants. James Kunstler has been touring, promoting his new book _The_Long_Emergency. His argument is: we (society, government) are responsible for the greatest misallocation of resources in history, specifically suburbs and the auto, and all that goes with them. In his view, society will change, radically and messily, as the price of oil increases. This site is not about Peak Oil, and I think we better choose to stop burning fossil fuels long before they run out. However, think about how our cheap-energy culture is essential to the very structure of our society, and you can see the reasons for denial and resistance. What US political party is going to stand up and say, “We need to design cities that work without cars, and that are close to all the resources they need for their populace to survive?” Imagine trying to implement that. Given the current will of the US public, there would be a revolution. Whether you’re arguing for the change because you think the oil is running out or because we’re killing the planet, people want “leaders” to tell them what they want to hear. Anyone here on the Atkins (or pretty much any) diet? Step 1: Show people the plain, unvarnished, and sometimes unclear truth. RE: #126 – What I foresee is a twofer. Simultaneously, densification of existing “established” sprawl (especially the stuff from 1930 – 1960) particularly in coastal urban areas, and, the continued establishment of exurbs, which will become increasingly detached from any current connurbations. Internet based working will free people from commuting for all but physical / manufacturing / boutique small businesses / low cost retail ala Wal Mart jobs and commerce. At some point, the newer edge suburbs will become non viable. The exurbs will morph into quasi rural small to mid sized cities. The nodal network pattern, not entirely dissimilar to what evolved in Europe in the Middle Ages, seems highly likely. RE – The great bearded one’s comments in # 134. I really don’t think it’s appropriate to couch these debates in terms of bad or good. The overarching question would be, what would have been the characteristics of climate variation if Man had never arose and what will be those characteristics given that Man has? If you can answer the latter or even, for that matter, the former, then I’ll be the first to submit your name for a Nobel Prize. People think its a piece of real journalism because most of the places where it has been posted do not carry the full byline, the original newspaper did that much at least.